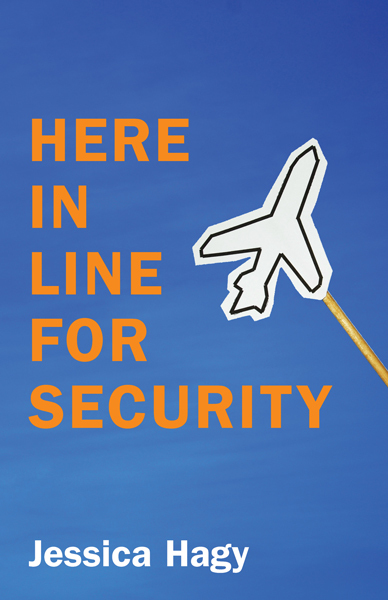 Jessica Hagy’s Here in Line for Security is a collection of poetry portraits written while the author was stranded at JFK International Airport in 2012, two weeks after Hurricane Sandy, when a Nor’easter paralyzed the Eastern Seaboard. Hagy, who has made a career out of turning ideas into simple illustrations, brilliantly distills imagined narratives into tight, smart poems. The result is a beautiful survey of the people who make up contemporary life; the people we see as we rush about our day; and their imaginary stories. Jessica Hagy mixes philosophical concepts with humour and simple visuals, making even the most complex concepts immediately accessible and relevant. Here In Line For Security is her first book of poetry. She is best known for her Webby Award-winning blog, “Indexed“. She is the author of the best-selling book, How To Be Interesting (Workman, 2013), Rotisserie Chicken or the Founding Fathers (Chronicle, 2009), and Indexed (Penguin/Viking, 2008). She has also contributed to over a dozen books including Data Points (Wiley, 2013), Beautiful Visualization (O’Reilly, 2010), Linchpin (Portfolio, 2009) and the forthcoming book, The Art of War, Illuminated, an illustrated translation of Sun Szu’s classic text on strategy (2015). Her work also regularly appears in the New York Times, Readers Digest, online for Medium, in her online column for Forbes, and in many other major outlets. Raised in Ohio and now living in Seattle, she holds degrees from Ohio University and Otterbein University. Ribbon Pig is a project about curating literature. We publish booklets and pamphlets that present contemporary writing. We do this to explore ideas about contemporary culture, draw connections between literature and art, and to promote the idea that you are what you read. Our goal is to build a community of people who would enjoy these objects and share our interests. Ribbon Pig (established in 2011, based in Montreal) is a project of Maison Kasini.